Want to be notified of new releases in galio-org/galio? Galio is a 100% free and open source project, licensed under MIT License. You'll be building Android and iOS apps in style. Galio will always remain free to use and it is powered by a massive world-wide community. It comes with a lot of carefully crafted, ready to be used components and a beautiful typography. Galio has a gorgeous base theme that adapts to each project. 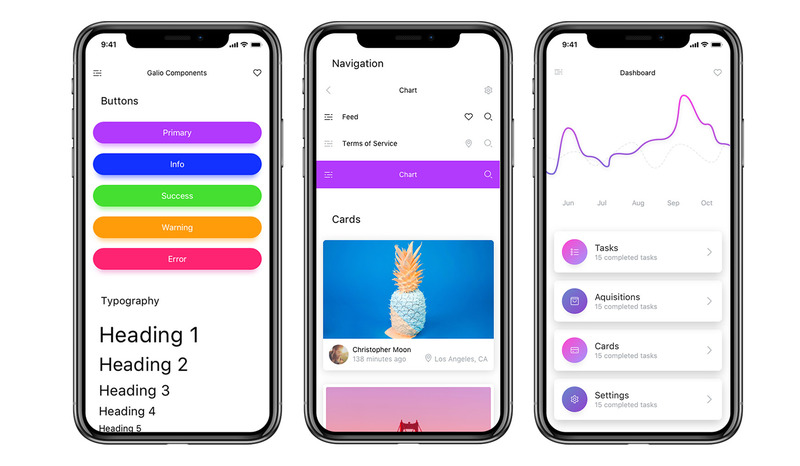 Built with real app examples, component demos, guides, and how-to's to get you up and running with mobile apps faster than ever before. Go ahead and install the app version of Galio in order to play around with our components and screens! Use our iOS or Android app directly on your physical device by running it inside Expo! Provide us with reproductible steps for the issue. Some issues may be platform specific, so specifying what platform and if it's a simulator or a hardware device will help a lot. © 2019 Galio, made with 💚 for the community.